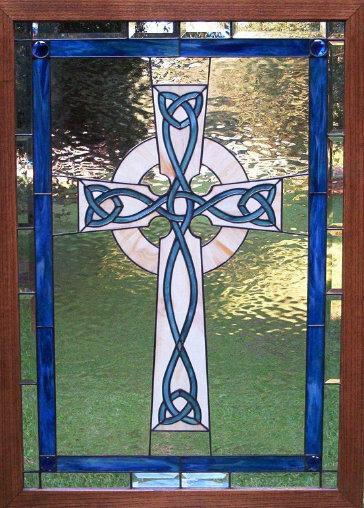 I wanted to build a stained glass Celtic Cross for years and never was able to find a good pattern. Finally, after months of internet research, I evolved the design on the left and built 2 different Celtic crosses in 2003, one with a blue band and one with a red band. These stained glass windows have hung in my home ever since then. 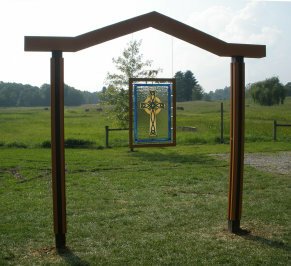 Corinne and Kyle's Cross contains about 105 pieces of glass, measures about 28" x 39". "In Ireland, it is a popular legend that the Celtic Catholic cross was introduced into Ireland by Saint Patrick or possibly Saint Declan during the time he was converting the pagan Irish, though no examples survive from this early period. It has often been claimed that Patrick combined the symbol of Christianity with the sun cross, to give pagan followers an idea of the importance of the cross by linking it with the idea of the life giving properties of the sun. However this theory is now thought unlikely by most art historians, who think an origination from crosses carrying a victor's wreath around their intersection is more likely. Such a cross is found on the reverse of the Liudhard medalet from Canterbury in England in the 590's" (from Wikipedia). 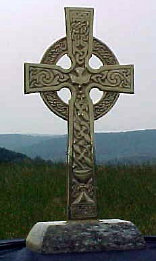 Existing examples of Celtic crosses date back to at least the 7th century. Tony called me in May, 2011 inquiring about the blue Celtic Cross. He explained that his daughter was getting married in September and he wanted my Celtic Cross as the cross to be used in the wedding. 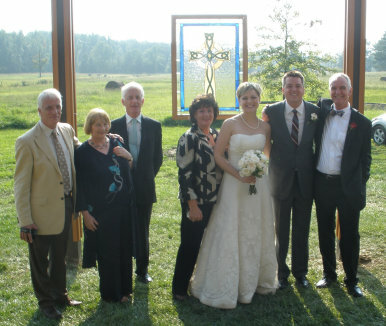 He described how he wanted to build a stand to hang the window in the background and the young couple would get married standing in front of the cross window. 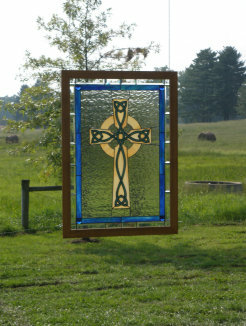 The cross then would be a gift that would hang in their home. I thought this was the most touching and marvelous idea. Having also given away a daughter in marriage, I was excited that my design was going to be used for such a noble purpose.